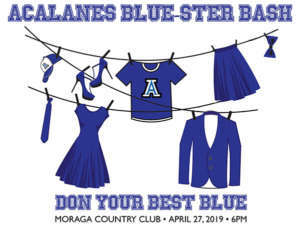 The Acalanes Blue-ster Bash is coming up on April 27th at Moraga Country Club. Consider becoming an Event Sponsor and help offset the cost of the Bash so MORE money goes to the kids! This is a great way to highlight your business. Below are the sponsorship levels, but a donation of any amount helps. If you can’t be at the event consider this a great way of helping out! Platinum- $1,000 sponsorship donation: Auctioneer recognition at event; premium logo placement on event website; full page ad in event program. One bottle of wine of your choice waiting for you at The Dons Club Level at MCC. Gold- $500 sponsorship donation: Logo placement on event website; half-page ad in event program. Four extra drink tickets in your name waiting for you at check-in at MCC. Silver- $300 sponsorship donation. Quarter-page ad in event program. Two extra drink tickets in your name waiting for you at check-in at MCC. Under $300 – Recognition in program.